Her Majesty The Queen has been pleased to approve the appointment of Judith Weir, CBE as the next Master of The Queen's Music. 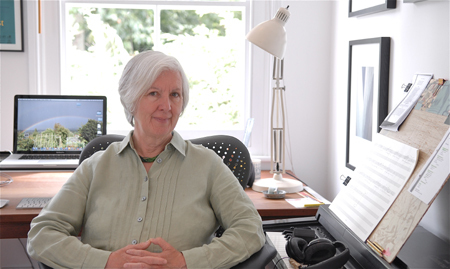 Judith Weir, who succeeds Sir Peter Maxwell Davies, is appointed for a fixed-term of ten years. The Queen will receive Ms Weir on assuming the appointment on July 22 at Buckingham Palace, London. At the same audience, The Queen will receive Sir Peter on the relinquishment of his appointment. The Master of the Queen's Music is an honorary position traditionally conferred on a musician of distinction. Since the reign of King George V, the position has carried no fixed duties, although the Master may compose pieces for special Royal or State occasions. Judith Weir said: "It is a great honour to take up the position of Master of the Queen’s Music, in succession to Sir Peter Maxwell Davies, who has given his musical and personal gifts so freely to this unusual national role. I hope to encourage everyone in the UK who sings, plays or writes music, and to hear as many of them as possible in action over the next ten years. Listening is also a skill, and I intend to uphold our rights to quietness and even silence, where appropriate. Above all, our children deserve the best we can give them, and that includes access to live music, whether as learners, performers or listeners." The Masters of The Queen's Music in the twentieth century have been Walter Parratt (1893-1924), Edward Elgar (1924-34), Walford Davies (1934-41), Arnold Bax (1942-53), Arthur Bliss (1953-75) and most recently Malcolm Williamson, who died in March 2003. Weir already has a long-standing relationship with the BBC Singers, who have been performing her music for over 10 years. Her first commission for the group was Concrete which premiered in 2008 at the BBC Composer weekend. The BBC Singers have performed Weir’s music in many notable venues including the Royal Albert Hall for the BBC Proms, St Magnus International Festival, Cadogan Hall and the Barbican Centre. During this time she began to write a series of operas (including King Harald’s Saga, The Black Spider, A Night at the Chinese Opera,The Vanishing Bridegroom and Blond Eckbert) which have subsequently received many performances in the UK, Germany, Austria, the Netherlands, Belgium and the USA. The most recent opera is Miss Fortune, premiered at Bregenz in 2011, and then staged at the Royal Opera House, Covent Garden in 2012. She now lives in London, where she has had a long association with Spitalfields Music Festival; and in recent years has taught as a visiting professor at Princeton, Harvard and Cardiff universities. Honours for her work include the Critics’ Circle, South Bank Show and Elise L Stoeger awards, a CBE and the Queen’s Medal for Music. In July 2014 she was appointed to the 388-year old royal post of Master of the Queen’s Music. Recent and forthcoming premieres include Ave Regina Caelorum (Merton College Choir/Cheltenham Festival 2014) Day Break Shadows Flee (Benjamin Grosvenor/BBC Proms 2014) and Good Morning, Midnight (Alice Coote, Aurora Orchestra/Wigmore Hall 2015). Judith Weir has begun work on a music-theatre piece with a new libretto by Ben Power, co-produced by Scottish Opera, The Royal Opera House Covent Garden and the Frankfurt Opera. The office of Master of The Queen's Music is the musical equivalent of Poet Laureate. It is an honour conferred on a musician of great distinction. Since the reign of King George V, the position has had no fixed duties, although the Master may choose to produce compositions to mark Royal or State occasions if he or she wishes to do so. The Master of The Queen's Music is paid an honorary stipend for her work. Sir Peter Maxwell Davies, was appointed in March 2004. On the appointment of Sir Peter, the term of the position was changed from life tenure to ten years, giving more composers the opportunity to take up this honorary position. The Master of The Queen's Music is also greatly involved in The Queen's Medal for Music in 2005, which rewards individuals who have made a significant contribution to the community at large, though music. The post of Master of The King or Queen's Music has a long history. Kings and queens dating back to the Middle Ages and earlier would employ a band of musicians as part of their households. Records show that Edward IV had 13 minstrels, 'whereof some be trumpets, some with shalmes and small pypes,' whilst Henry VIII's band in 1526 consisted of '15 trumpets, 3 lutes, 3 rebecks, 3 tamborets, a harp, 2 viols, 9 sackbuts, a fife and four drumslades'. The number of musicians in the Sovereign's band grew over time and became known as 'the Musick'. The office of Master of the King's Musick was first created in the reign of Charles I when Nicholas Lanier was appointed in 1626. From this time onwards there were Masters of the King's or Queen's Musick who were responsible for the band of Royal musicians. These bands were Court musicians, playing at meals for the Sovereign and the Court's entertainment. During the reign of James II in the late seventeenth century, the role of the Musick became more important. In addition to its ordinary duties, it was employed, together with the gentlemen and children of the Chapel Royal, in the performance of the odes annually composed for the King's birthday and New Year's Day. These odes were composed by the Master himself. Between 1674 and 1700, Nicholas Staggins composed several Royal birthday odes as Master. The production of such odes did not last long, however, and soon the Master's duties were reduced to attendance at Royal Weddings and baptisms, and other State occasions. The Musick continued in this way through to the end of the reign of Queen Victoria, and the role of the Musick and the Master gradually diminished in importance and profile. By the time of King Edward VII in the early part of the twentieth century, the band no longer performed any concerts at all, though the musicians sometimes played at Court functions. Under King George V, the number of musicians with Court appointments dwindled and the position of Master of the King's Musick eventually became an honorary one. Sir Edward Elgar was greatly influential in shaping the role of Master when he served under King George V. He was appointed as Master of the King's Music in 1924 (the 'k' of 'Musick' was finally dropped during Elgar's service). His compositions included 'The Nursery Suite' for Princesses Elizabeth and Margaret in 1931. The Queen's Coronation in 1953 saw musical compositions from two Masters. Sir Arnold Bax (Master from 1942-53) had the honour of composing the Coronation March for The Queen, whilst Sir Arthur Bliss (Master from1953-75) wrote a Processional for the Coronation. For The Queen's Silver Jubilee in 1977, Malcolm Williamson, one of the longest serving Masters (from 1975 - 2003) composed Mass of Christ the King and set to music a hymn written by the Poet Laureate, Sir John Betjeman, for the occasion. In 1985 he composed Songs for a Royal Baby in honour of the birth of Prince Henry of Wales.